Stop reaching for high notes! Quite often I’ll see singers lifting their chin or even standing on tip toes as they approach the top of the range. Partly, I think this is because we describe them as ‘high’ notes and ‘high’ means ‘up’. In all string instruments, pitch is determined partly by the tautness of the vibrating string. 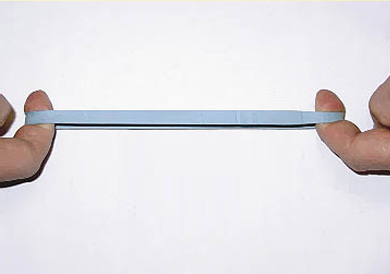 Stretch an elastic band and pluck it – the more taut the band, the higher the pitch. It’s the same with the vocal folds – the more you stretch them, the higher you sing. But that stretch is literally from the back to the front. So a much simpler way to think about pitch is to think in terms of how stretched the vocal folds are. In that model, ‘high’ notes are stretched more than ‘low’ notes. So rather than ‘high’ and ‘low’, think ‘stretch’ and ‘relax’ or even ‘front’ and ‘back’. Hopefully this should stop you staring at the ceiling as you reach the climax of your song!